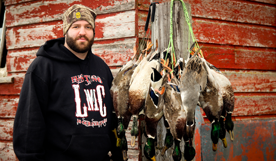 Chris has been waterfowl hunting since he was 14 years old. Thanks to his two best friends from high school that insisted on him going to a public hunting spot at Rend Lake, to kill a lonely mallard hen. Needless to say, he’s been obsessed with duck hunting and goose hunting ever since. Growing up in Southern Illinois around the Rend Lake area, Chris has experienced some of the best waterfowl hunting Illinois has to offer. .Chris primarily hunts waterfowl, but dabbles in turkey and pheasant hunting.